Electricity is one of the largest overheads for many businesses, and with power prices soaring it’s time for companies to get smart about energy. Having a good Power Factor is imperative to keeping bills low – yet it’s often overlooked. This article explains everything you need to know about Power Factor and Power Factor Correction. 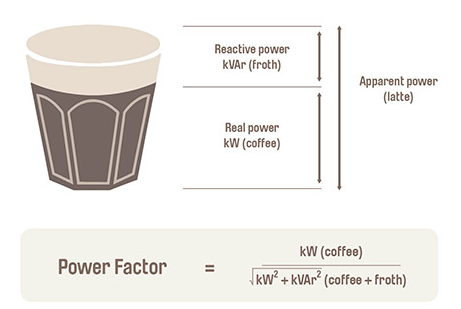 Power Factor is a measure of apparent power (kVA) as a ratio of real power (kW) and is an indicator for how efficiently a work site uses supplied energy. Apparent power is the total of real power and reactive power. Real power refers to the electricity equipment actually consumes, while reactive power is usually a side-effect – electricity that’s drawn but has no real purpose. To illustrate this, take the coffee diagram from AGL below. The liquid represents real power – the useful part of the coffee we want – while the froth is just a result of pouring coffee into the mug. The entire coffee represents apparent power and is what your energy retailer charges you. More liquid and less froth means a higher power factor. A power factor is between 0 and 1. The higher the power factor, the more efficient your work site is at utilising supplied power, which should lead to lower power bills. Regulatory compliance: Many energy distributors have a minimum power factor requirement of 0.8. Keeping on top of your Power Factor means you avoid possible penalties. Improved equipment life: A higher voltage resulting from a poor Power Factor may damage your equipment. Demand changes: If you’re one of the few businesses on a KVA demand tariff, a good Power Factor will mean lower demand changes and even greater savings on your bill. 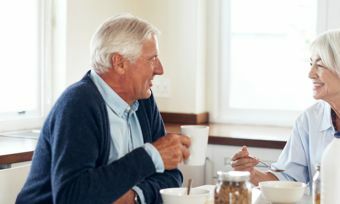 Increased capacity: Reducing the amount of electricity going to waste as reactive power means you’ve freed up capacity to install new high-usage appliances. Reduced carbon footprint: By reducing electricity wastage, you’re lowering your business’s carbon emissions. This video explains even better than words. Power Factor Correction may be required if your power factor slips below 0.9. Failing to correct a poor power factor won’t just lead to much higher power bills, it may significantly damage sensitive electrical components in equipment and machinery. Of course, the best and most obvious Power Factor solution is to stop it, before it becomes a problem. Check the Power Factor of appliances in their specs before you buy and make sure electrical equipment is correctly calibrated to the right voltage.